Edward Walsh grew up in Boston, attended Catholic University in Washington DC as an undergraduate, and received his Masters Degree from the University of Massachusetts, Amherst. Extensive study in China, Japan and Italy has greatly influenced his perception of color, light and form. Using acrylics for the most part, his work ranges from portraiture to abstraction. He seeks out the unexpected in the commonplace, and often paints items whose beauty goes unnoticed in daily life. His special emphasis is on floral and architectural subjects. His first visit to Provincetown was in 1954, and he has made a home there since 1987. He remains enthralled by the town, its architecture, landscape, people, and most of all, its incomparable light. He finds inspiration in the shadows and shapes of his garden, as well as the ever-changing moods of Cape Cod Bay. He studied the Philosophy of Art with Paul Weiss, and painting with Franny Golden, Rob Longley, Mary Giammarrino, Cynthia Packard, Cedric and Joannette Egeli. His work is in private collections throughout the United States, as well as France, Italy and Canada. His artwork also graces the cover of Carla Sodini’s recently published book, Storie Lucchesi. 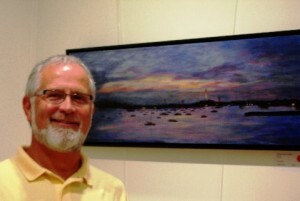 Local exhibits include the Fine Arts Work Center and Provincetown Art Association and Museum. He currently divides his time between Provincetown and South Beach. Edward Walsh is exclusively represented by the Cortile Gallery. My unrelenting challenge is to translate the wonder of a person, object or place onto a two dimensional surface. Like most of us, I have had experiences with people and places that I wish would last forever. (Particularly with the beauty and phenomenal light of Provincetown!) I try to capture that wonder in my work. When painting portraits, I hope to extract the truth of my subject, looking past the facade of the individual, to the essence within. My sincere hope is that anyone who views a portrait will resonate with the passions, spirit, and joie de vivre of the subject, seeing well beyond the surface. I believe that this approach applies to still life as well. There are times that we just see objects around us; we don’t observe them in all their beautiful complexities. I love to capture this dimension on canvas and give focus to qualities that might have otherwise been overlooked.